Action Target's new computerized, wireless indoor range lane system uses a moving, rotating target to provide shooters with timed drills, shooting games, and qualification courses.The target carrier retreated into the darkness, hesitated, twitched as if uncertain, and suddenly turned face on as a light appeared and illuminated it. Hostile! I caught a quick sight picture over the night sights of my Republic Forge 1911 and triggered two quick shots, the second barely scraping into the target's center as the light went off and the target turned edge-on and disappeared. Nerves a-jangle, I glared into the darkness, listening to the target carrier moving and trying to anticipate its next move. How often have you hung a paper target on the hanging cardboard carrier in an indoor shooting lane, used the provided buttons to run it out, shot holes in it, brought it back, looked at the holes, and repeated? It doesn't take long until you are thoroughly bored. Wouldn't it be a lot better if those hanging target carriers came to game-programmed, electronically controlled life and offered greater challenge? Stapling paper rifle targets on a box and putting it downrange isn't much fun, either. I only submit to such tedious shooting when I'm performing technical accuracy testing with a new rifle or untested type of ammunition. It's far more fun to shoot at reactive targets. Here in my home state of Utah, a giant of a target company quietly produces outstanding, innovative targets that bring shooting fun and training effectiveness to elevated levels. I recently had the opportunity to tour Action Target's facilities and spend a day shooting on several of the company's outstanding target systems with Marketing Manager Seth Ercanbrack. Although I've spent a lifetime shooting in the field, shooting competitively, hunting, and writing about guns, before the day was over I'd been challenged, I'd learned new skills, and I'd had more fun shooting than I'd experienced in some time. Here's a closer look at both, starting with the indoor system. Challenging reactive targets help you become a better shooter. As a consumer, you won't be purchasing an Action Target setup for a personal indoor shooting lane (unless you are eccentric and own a rather plush bank account). However, many indoor ranges across the country use Action Target retriever systems, and future system sales will come packaged with the new training programs rather than the standard run-it-out, run-it-back retriever—at no increased charge to range owners, either. Plus, existing Action Target controllers can easily be replaced with the new version, as long as the existing target carrier is the top-end, AWD wireless retriever. How does it work? In essence, the target carrier that runs downrange on a rail is capable of rotating 360 degrees to present the target edge-on; of rotating 180 degrees to present a hostage or "no-shoot" target, of spinning, and of "teasing," wherein the target twitches as if it's about to turn face-on but doesn't. It will also fake you out, teasing and then suddenly presenting. The control panel hanging on the left of the shooter bay is programmed with 27 shooting drills and games, including a drill that mimics the FBI qualification course of fire. Wirelessly paired together, they challenge shooters like no other existing indoor system that I'm aware of. Indoor Range Product Marketing Manager Jesse Nelson selects a program on the new computerized controller. Additionally, the unit is outfitted with red and blue strobes that can be activated to simulated night-time conditions with glaring, distracting police lights ablaze all around, and can also simulate night conditions wherein an officer or soldier wearing night-vision goggles might suddenly be faced with the blinding muzzle flashes of a shooter. It's set up to function in the shooter's choice of feet, yards, or meters, and is manually programmable in an instructor mode to enable teachers to work on particular skills with students. Indoor Range Product Marketing Manager Jesse Nelson showed me how the controller works, emphasizing the fact that it's engineered for simplicity of use and clarity, so that even first-time shooters easily understand the various options and the courses of fire for the various drills and so forth. 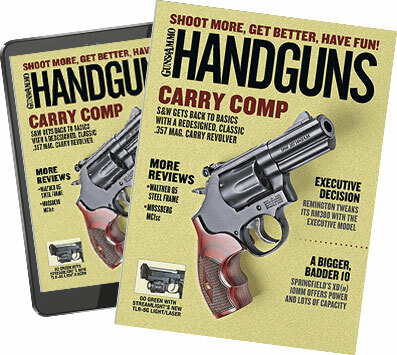 On the touch screen I toggled through the quick-start menu and scanned the various drills, which are broken up into Basic, Intermediate, and Advanced categories for Pistol and Rifle, plus decision drills of various difficulty, and different games. I asked for a suggestion. With a grin, Nelson chose a timed, varying distance drill, and the control panel instructed me to put two shots on target each time the target face presented. Two minutes and 16 shots later, I was thoroughly humbled—and determined to better my score. Literally hundreds of shots after that I mentally emerged back into the present and left the enchanting world of shooting drills behind, amazed at not only how fun the shooting had been but pleased with the unexpected improvement in my target acquisition and rapid-fire skills. Twenty-seven drills and games of various difficulty are available to the shooter at the touch of a finger. "Let's wrap up by running the FBI qualification program," Nelson suggested. I agreed with alacrity. Four stages and 50 rounds later, I'd passed with only three points dropped. While an Action Target indoor lane, target track and hanger, and controller aren't a practical investment for an individual shooter, spending time shooting on one is. Get on the web and research local ranges built with Action Target guts, and once the new controllers show up, spend some time shooting the drills, games, and qualification courses they provide. In short order your skills will improve, and you'll have tremendous fun as they do. But be warned: your ammo budget will have to go up. The best skill-building steel targets available challenge pistol shooters in several areas: shot placement, speed, observation, and reaction time. Outdoors and away from computer-controlled targets, nothing is better than a plate rack or dueling tree. As Steel Target Product Marketing Manager Chris Hess pointed out, plate racks designed for use with powerful centerfire pistols are expensive, big, and heavy, so they're of most use to a club or public shooting range. While plate racks for heavy-hitting centerfire handguns are expensive and excessively heavy, rimfire versions are affordable, portable, and extremely useful for building skill and having fun. However, in the rimfire world things change. Action Target makes a portable plate rack designed specifically for rimfires. Weighing in at 50 pounds and priced at $239 for the rack, stand, and reset cable, it's a great option for hauling to your favorite shooting spot and spending some quality personal time with your favorite plinker. You don't need a buddy, although you can duel by starting at each end and attempting to knock down all of your plates and one or two of your buddy's before he can. Many 3-Gun and action-type pistol competitions utilize plate racks for portions of their shooting stages, so perfecting your speed skills on a rimfire version will serve you in good stead should you sally forth to the local competitions. Centerfire dueling trees cost far less than equal-rated plate racks and are easily moved by an individual, so they're more practical for personal purchase. Dueling trees are fun to shoot on your own, but much more fun with a buddy. As most of you know, you go head to head with half the plates on each side of the tree, and attempt to knock all the plates to your opponents side to win. Keeping cool and placing rapid, accurate shots is critical, as is the ability to make fast, smooth magazine changes. Renowned landscape artist and long-distance shooter Clay Wagstaff contemplates a new E-50 Action Target torso plate made of ½-inch AR550 steel prior to breaking it in at 1,000 yards. In the realm of the rifle, rimfire plate racks and dueling trees serve to help you build your skills, but when you really get serious a big, heavy torso-shaped plate can do more for your precision riflemanship than just about any other target. I really like two: my go-to steel rifle target is expensive ($499), heavy (146 pounds), and oh-so useful at just about any distance. It's Action Target's E-50 silhouette, which is made of ½-inch AR550 steel and is rated for .50 BMG at 100 yards. In other words, it's extraordinarily tough. While it measures 19.5 by 40 inches, it hangs on its stand at a 20-degree angle so as to deflect fast, heavy projectiles safely downward, and that angle shortens it's appearance to that of a typical torso shape. It's big enough that I typically use it at ranges from 600 yards to 1,200 yards. Recently, my team members and I used it as a 600-yard practice target prior to competing in the Utah State CMP High Power Team Championships, and the practice paid off: our pair of two-man teams took first and second place. It's also particularly useful for working out true long-range rifles at extreme distances. Action Target's 3/8-inch AR550 steel IDPA practice target doubles for pistol and rifle use. It's superb for refining one's precision shooting ability. My other favorite Action Target torso plate is useful for both rifle and pistol work. Named the IDPA Practice Torso, it's a reduced-size plate originally conceived of for honing one's skills for International Defensive Pistol Association completion, but it's made of 3/8-inch AR550 steel and is rated for rifle bullets at 100 yards or more and 3,000 fps or less. With dimensions of 12 inches by 25.75 inches it's big enough to catch shots easily and give you a read on where your shots are impacting. Plus—what I really like—it has two reactive flappers ideal for testing your fine precision skills: One is round, centered in the upper chest area of the target and measures six inches, the other is centered in the steel plate's "head" and measures three inches square. Shoot through the hole in the target, and the reactive steel plate behind moves. Few things help me build rifle skill—whether with an AR-15 carbine, a hunting rifle or a long-range precision rifle—more than a target that offers very small targets yet a large enough outer surface that provides instant, accurate feedback on my "misses." This target is much easier to physically handle, too. It weighs 59 pounds. And the price is easier to stomach: $339. Action Target isn't the only company that builds indoor target systems and steel plate targets, but it's one of the best and has a vast selection of target types, only a few of which are listed here. All the company's plate targets are designed without exposed bolts, chains, holes, or other brick-a-brack that is so easily destroyed by bullets. They're engineered for maximum impact control, and premium steel minimizes wear and damage. I've only hit the high points of my favorite targets here, and it's worth a few minutes online to check out the others—literally dozens of innovative reactive and static steel targets. Shooting instructors, specifically those that focus on accuracy, will tell you that quality practice is always more effective than quantity practice. Scenarios, time limits, and simulated pressure help hone cognitive skill and reaction time along with shooting skill. Shooting the right indoor system and the right feedback-providing outdoor targets is important—time is rare and valuable in today's fast-paced world. As mentioned above, Action Target isn't the only company in the business, but they're one of the best. Check 'em out at www.actiontarget.com.